DANDENONG (237) could not nix the Camberwell Mapgies’ (7/269cc) top order as Simon Hill (74) and number-three Daniel Rawson (84) plundered a 109-run partnership to set up the victory. The pair were finally broken as Hill fell to Dan Doran (1/56), spinning his way past the Camberwell opener’s edge and into the gloves of David Alleyne. From there the heavy lifting fell to Rawson who carried on pushing Camberwell to 4/236 before he was claimed by a strong James Nanopoulos’ catch off Justin Butterfield (2/56). Nathan Lambden (2/43) had a great day in the field as he pinched two wickets and earned a run-out. The Panthers fought back through their own top order – Tom Donnell (77) and Brett Forsyth (55) dusted off their scintillating top-order dynamic to pile on 123 to start the chase. Both would fall to Simon O’Brien (2/28) before the rest of the batting started to give way and collapse. Peter Sweeney (35) and James Pattinson (29) did what they could, but the Magpies had the arsenal necessary to win the battle. Mark Dwyer (4/42) led the charge down the Dandenong order to finish the task at hand and dismiss the Panthers 32 runs shy. Dandenong played Geelong on Sunday as part of the one-day double header round. Results were unavailable at the time of the Journal going to print. DANDENONG Lions (7/120) batted deeply to take the points away from Essendon Maribyrnong Park (118). Julie Hunter (1/17) and Emma Gallagher (1/12) kept proceedings economical for the Lions as the visitors failed to push on and live up to their top-of-the-ladder billing. The key wicket of Molly Strano (37) fell after a gutsy innings. Her knock was ended by Primrose Wohlers (5/23) who went on to claim her first five-wicket haul in her Premier Cricket/VWCA history. Wohlers stormed through the Bombers tail with Emily Smith (18 not out) the only batswoman to survive the carnage. The response was guided by Sarah Elliott (58 not out) as she continued her not-out season start with Australian team mate Hunter (21) and Shelly Hart (18) sticking around to let the Test specialist chase the runs at the other end. Brighton District (1/89) chased the Dandenong (86) seconds tally as Lions’ captain Carin Eastburn (30 and 1/3) continued her strong start to the year with the bat. 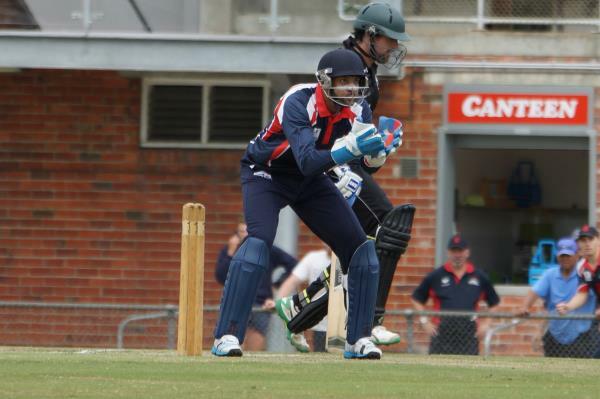 Dandenong hosts Box Hill on Saturday for a shot at top spot in the Women’s Premier Cricket ladder.